Another show, another two contestants! Will anyone ever be able to beat the record? This show’s two contestants must test their grammar knowledge of adjectives! Those just-before-a-noun words that put some detail into our dialogue. Who will succeed? What will the prize be? Why are the contestants acting so strangely? Find out in this episode of the Grammar Gameshow! Hello and welcome to today’s Grammar Gameshow! I’m your host, Will! It’s all you’ve got! And of course, let’s not forget Leslie, our all-knowing voice in the sky. Adjectives! Those useful words that put some detail into our dialogue. It’s nice to meet you. I’m Charlene. Welcome one and welcome all, answer me right, or take a fall! Anyway, let’s move on to round one. This is a control round. Answer the first question correctly, and I’ll ask you three more. You must answer all three correctly to get any points. True or false: Adjectives always come before a noun. Wow, you seem very confident. Remember, you must answer all three of the following questions to get any points. Willy?! I haven’t been called Willy since… But that was such a long time ago. Where is the adjective in this sentence? He lives in a blue house. The adjective is ‘blue’. It comes before the noun ‘house’. Like I said! Try this one. The ferocious shark swam quickly. ‘Ferocious’ - adjective . ‘Shark’- noun. Adjective before noun, yawn! OK! Last one. I feel happy. The adjective is ‘happy’. It comes before… Oh! Charlene. Would you like to answer this one? ‘Feel’ is a linking verb so it can connect with an adjective. But the adjective comes after. Well done! Adjectives commonly go in two positions. They can appear before the noun they are describing or they can follow a linking verb, such as: ‘become’, ‘feel’, or ‘be’. Well done, Charlene. You get all of Stacey’s points. Hey! That’s not fair! I answered three out of the four! Willy! Please! Well, when you put it like that. 10 points to Charlene and 20 to Stacey. Hey! I see you! Two can play at that game. Carry on, Willsy! Willsy? I haven’t been called that since… But, that was such a long time ago. OK, on to our next round, and this will be quick-fire round. Everybody knows that adjectives have an order. Here are some adjectives. I want to know what order they should go in. The noun is ‘suit’. Ready? Old. An old beige suit, Willsy. An old beige woollen suit, Willy. An old beige American woollen suit, Willsy. A medium old beige American woollen suit, Willsy! Good job! Though it is unlikely that you’ll order so many adjectives for one noun, the order goes: size, age, shape, colour, origin, material! Though there are other types of adjectives which do not feature in this list, such as: adjectives of opinion. Seriously, how hideous. Who’d wear a suit like that? Yeah! For once, I agree. Just tacky, tacky, tacky… on most people, but not on you Willsy! Yeah, you’ve got the build to pull it off, Willy. Yes. I thought so too. Ten points each and later you can tell me more things about myself! On to our third round - and it’s time to get extreme, ladies. Ladies, show me ‘extreme’! Yeah, very nice. Some adjectives are called ‘non-gradable’ or ‘extreme’. I’m going to give you an adjective and you’re going to give me the extreme version. Ready? Tasty. 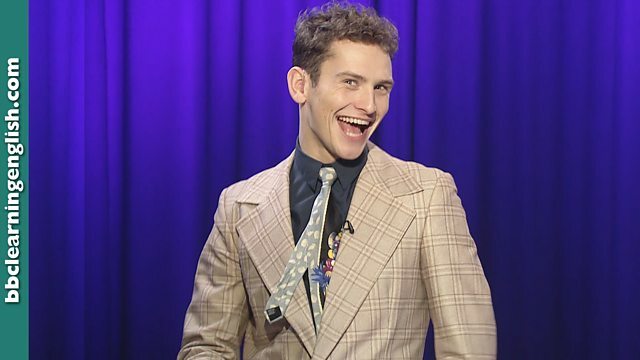 Willsy looks utterly delicious in his suit. Everything you say is absolutely fascinating. Stop, stop! No, no, no! Don't stop! Handsome. The host of this show is totally stunning. Well, this is unexpected. Leslie? Absolutely perfect! Gradable adjectives can be made more or less using words like ‘very’ or ‘a bit’. Non-gradable adjectives, however, are too strong. You cannot be ‘a bit exhausted’. In order to modify them, we need a stronger adverb such as ‘absolutely’, ‘totally’ or ‘utterly’. Excellent work. Here are twenty points each in mixed currency. And that brings us to the end of today’s Grammar Gameshow. And the winner is… Stacey! Well done! Here’s what you’ve won! It’s Will’s favourite pair of shoes! When did you get them? And Charlene. You did well, but not well enough I’m afraid. Here come the owls! It looks like we’ll need another contestant. So…where are we going for dinner? Whoa! Fun and games aside, you’re a nice person, but we’re not even in the same league! Men! Hang on Charlene! Sisters before misters! Death before dishonour. Respect! Thanks for joining us. Say goodbye, Leslie. Adjectives are describing words. They add detail to a noun. In the majority of cases, adjectives occupy one of two positions: immediately before the noun they describe, or following a 'linking' verb, such as 'become', 'feel' or 'be'. I feel very warm, but if you open the window it will become cool. When many adjectives are used together, they have an order. Though it is unlikely that you’ll order so many adjectives for one noun, the order goes: size, age, shape, colour, origin, material. There are other types of adjectives not featured in this list, such as adjectives of opinion. I bought a big old wooden trunk. Have you seen my new red, yellow and blue necklace? Adjectives can be gradable or non-gradabe. Gradable adjectives are able to be modified using adverbs like 'a bit', 'somewhat', 'quite' and 'very'. Non-gradable adjectives cannot because they are too strong. In order to modify them, we use different adverbs, such as 'absolutely', 'totally' and 'utterly'. It's a bit hot in here, don't you think? It's absolutely boiling in here! Which of these does not correctly use an adjective? The order goes: size, age, shape, colour, origin, material. Which of these uses the correct adjective order? Which of these adverbs do we NOT use with a non-gradable adjective?